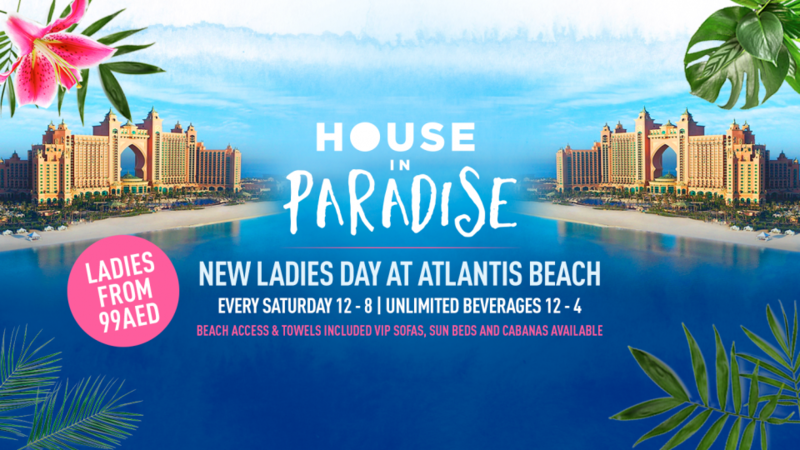 Kicking off on Saturday 2nd February HOUSE in Paradise will be taking over the Atlantis every week with their Ladies’ Day event. The Atlantis being one of Dubai’s most glamorous venues will be transformed into a hidden world of tropical wonders equipped with marvellous production, and a soundtrack of hedonistic house supplied by the House Events resident DJ’s. With 3 unique packages to choose from for both ladies and gents and at a price which can’t be beaten in Dubai – starting at just 99 AED! The packages include variations of Rose all day, a cocktail pitcher of the day which will change weekly, sparkling Bellini’s and of course a food menu of only the highest standard to compliment an already lavish package, we can’t think of a better way to spend a Saturday in the sun! Tickets can purchased on entry with no prior booking required, or reservations are taken in advance.